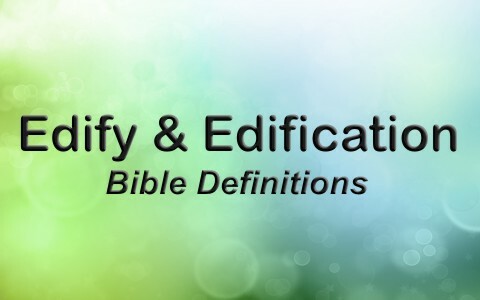 What does the word “edify” or “edification” mean? Why is this important to know? The world does a good enough job in tearing us down or beating us down. This heavy laden, sin-soaked world can press down upon us until we feel we’ve been beaten all the way down to the ground but this should not be so with Christians. Even though we’re in the world, we’re not of the world but the world still pummels us and tries to wear on us. The Apostle Paul writes to the church to “encourage one another and build one another up, just as you are doing” (1 Thess 5:11 ESV) and as Jude writes, “you, beloved, building yourselves up in your most holy faith and praying in the Holy Spirit” (Jude 1:20 ESV). Paul writes to the Corinthians, “It is in the sight of God that we have been speaking in Christ, and all for your upbuilding, beloved” (2 Cor 12:19 ESV). Here’s what building up one another looks like, “Let no corrupting talk come out of your mouths, but only such as is good for building up, as fits the occasion, that it may give grace to those who hear” (Eph 4:29 ESV). We ought to never be tearing down one another but always be building up one another. In writing to the young Timothy, Paul instructs him, “Until I come, devote yourself to the public reading of Scripture, to exhortation, to teaching” (1 Tim 4:13 ESV) and to “preach the word; be ready in season and out of season; reprove, rebuke, and exhort, with complete patience and teaching” (2 Tim 4:2 ESV). To exhort means to correct, rebuke, or “fill up with courage” as the secular definition says but it’s much more than that. To exhort someone is to urge by strong, often stirring argument, admonition, advice, or appeal and even to urge someone to take as specific action by using strong advice or a warning. That might not feel good to the hearers but this is done in love, just as God disciplines every child He loves so “do not regard lightly the discipline of the Lord, nor be weary when reproved by him. For the Lord disciplines the one he loves, and chastises every son whom he receives” because “God is treating you as sons. For what son is there whom his father does not discipline” (Heb 12:5-7 ESV). The word “edify” is the same thing as building up and the Greek word that the Apostle Paul used was “oikodomeō” which means “to build a house, erect a building” or “to build up from the ground” and this is perfectly fitting as I said earlier, the world’s busily beating us down so we need to be building up others in the church but I also believe those who are not Christian also. There is no reason to think that this is just for believers, but of course it is, but for those who are weary and heavy laden, they need building up too. Today we understand that the word “edify” or “edification” means the act of one who promotes another’s growth in Christian wisdom, piety, happiness, holiness and this is the way that Paul uses it in 1st Corinthians 10:23 where Paul wrote, “All things are lawful for me, but not all things are helpful; all things are lawful for me, but not all things edify,” so he acknowledges that some things don’t edify or build up and if they don’t build up, even thou we have grace to do certain things, they can actually tear down which is just the opposite of what God desires. Incidentally, the root word for “edify” is “edifice” like that of a building’s foundation or the face or structure of a building and that building is the Body of Christ in the church’s case. We have a music worship leader that I believe is the most joyous person in our church and has more joy than anyone I know of. He literally shouts praises in worship songs and that is one of his strengths, just as Nehemiah wrote “And do not be grieved, for the joy of the Lord is your strength” (Neh 8:10 ESV). I encourage him and build him up with sincere compliments because he does a great job in our church in building up the members. I also try to compliment one person or more every time I see them, in our out of church, with the purpose of building them up and encouraging them. I love what I call the “Three E-migos;” exhort, edify, and encourage. These are all positive, uplifting, and upward building things we can say and do so that others will be built up and not torn down. The reason it’s so important to edify one another is expressed by the author of Hebrews who wrote, “let us consider how to stir up one another to love and good works, not neglecting to meet together, as is the habit of some, but encouraging one another, and all the more as you see the Day drawing near” (Heb 10:24-25 ESV). I believe as the days grow more and more evil and the persecution grows worse and worse (which it is), we are going to desperately need to be encouraging one another, building up one another, and edifying one another. This may be more important today than at any time in the church’s history, but the point is, we should be building up one another, more and more, even more so as we see the day of Jesus’ return approaching (whenever that will be). Resource – Scripture quotations are from The Holy Bible, English Standard Version® (ESV®), copyright © 2001 by Crossway, a publishing ministry of Good News Publishers. Used by permission. All rights reserved. Some Scripture taken from the New King James Version®. Copyright © 1982 by Thomas Nelson. Used by permission. All rights reserved. I’m going to speak on what my pastor means to me. Would it be appropriate to say upon hearing you preach God’s word and being edified I knew God had placed me here at UNION BAPTIST CHURCH? Hello Lillian and thank you for your question. As a pastor myself, I would be overjoyed to hear that and in fact, I heard one man and his wife say that to me in church and my heart leaped for joy. I believe God did place you there and He will use you there in some ministry as we all have a ministry (Matt 25:34-40). God bless you and the Union Baptist Church. Next post: What Is The 6th (Sixth) Commandment In The Bible?